Luxury Swiss watch maker Girard-Perregaux has created the world’s first chronograph to indicate the different times around the world including New York, London, Hong Kong, Tokyo and Dubai. 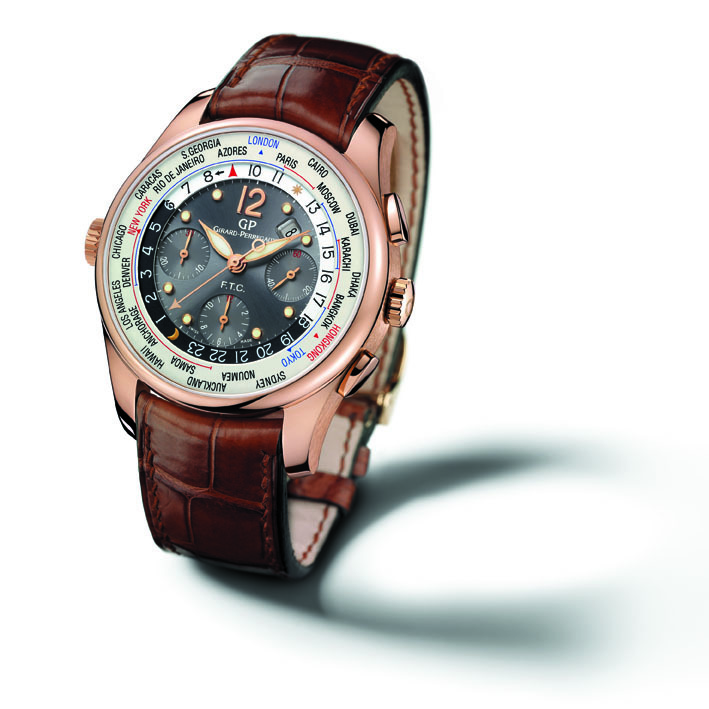 The timeless elegance of Girard-Perregaux’s ww.tc line blends well with its resolutely modern functions. The watch can be used to read, simultaneously and very easily, the time in twenty-four time zones, represented by twenty-four international cities; hence the name, ww.tc, the abbreviation for World Wide Time Control. The novel watch ww.tc - Financial reflects Girard-Perregaux’s great watchmaking tradition, its passion for design and its modern, daring vision. This original and ingenious marriage between technology and aesthetics depends on two mobile discs around the dial: a 24-hour ring is synchronised with the hour hand. A second disc can be adjusted with the crown at 9 o’clock; it displays the names of the twenty-four cities and the periods when the four bourses are open for business. When the red pointer on the hour ring is opposite one of these periods, that particular market is open. In keeping with the Brand’s passion for detail, the ww.tc - Financial has been perfectly designed. The hour ring features a day/night contrast, making it easier to read, and harmonises with the silver or anthracite dial. The large gold case, 43 mm in diameter, houses a Girard-Perregaux automatic mechanical movement. This sophisticated mechanism can be admired through an anti-reflective sapphire crystal. Two limited, individually-numbered series are planned for ardent steel-case enthusiasts.